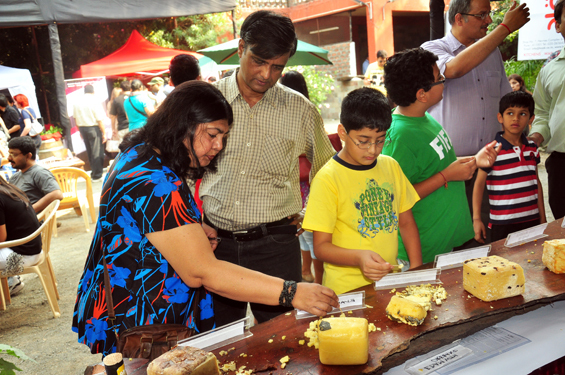 The ABC Farms Cheese Festival was held on 24th& 25th November,2012 at Koregaon Park, Pune. 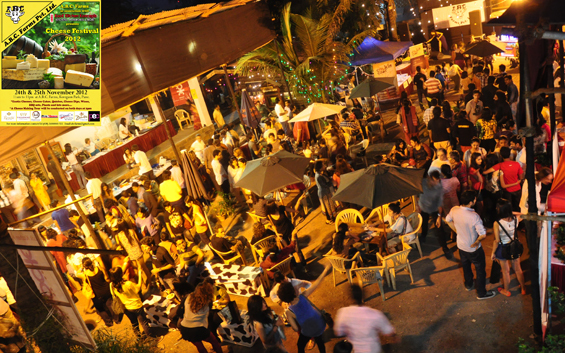 There was an impressive turnout on the 25th& a great response to the festival. I saw a wide variety of cheese… the regular Cheddar, Mozarella, Gouda, Parmesan etc… the old favorites… coffee, cranberry, smoked ham, wine soaked, ash coated, wood buried cheese. The new ones introduced were Pecorino, Pepperoni, Prunes & Port Wine, Edam with Apple & Roasted Walnuts, Mango & Mint Gouda, Edam with Morrels, Goat Cheese (a year old well ripened), etc. The cheese tasting was fun and the cheese I loved the most was Edam Cheese. I enjoyed the various cheese dips which were put up for tasting. My favorite being the smoked ham dip. The ABC Farms Lemsi (lemon flavored lassi) which is another of my favorites and some wonderful cheese cakes & quiches were on sale too. I bought cheese cakes which were so delicious. 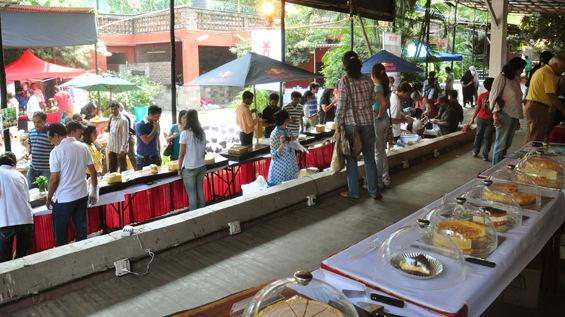 I did see people enjoying fresh pizzas & pastas which were prepared with their cheese. I was truly impressed by their products from their organic farm and herb garden. ABC Farms includes their very own herbs in their cheese. Herbs, Organic Rice & Herbed Vinegars were on sale. 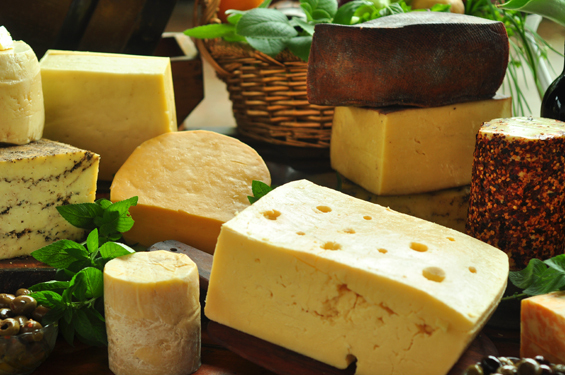 I have been buying cheese and other dairy products regularly from their main branch and their other outlets. What I like about the enterprising Chinoy family and most will agree, that they respect the environment and give a lot of importance to ecology. Most of their packaging is also eco friendly…they hand out their products in newspaper bags. It was wonderful to see Mr.Chinoy, the owner & the brain behind ABC farms along with his family not only present, but actively involved in the activities during the festival. A tour of the dairy, conducted by Mr.Chinoy, was organized on both days and he explained the process of cheese making personally. The session was overcrowded so I did not participate in the tour. 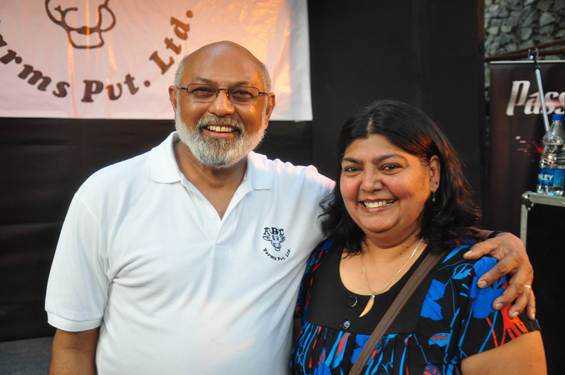 The highlight of the festival was the presence of well renowned New York Chef, Walter D’Rozario of Chopped Food Network Fame. He dished out simple & easy dips with cheese from ABC Farms. Chef Walter is an accomplished, Michelin starred chef who is so simple & down to earth. 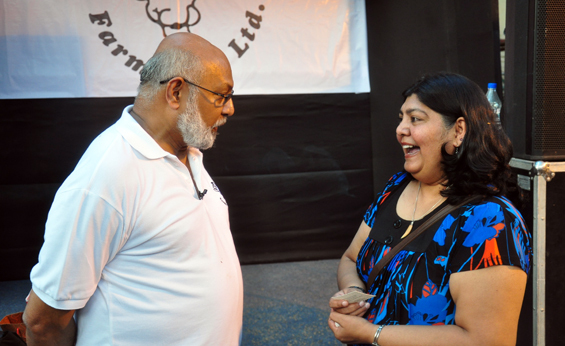 He was open to queries & interacted with people after the demonstration. I had the privilege & honor of meeting him. He spent some valuable time talking to me & it felt good to know that we both share the love for Kashmiri chillies, Fish & Seafood. 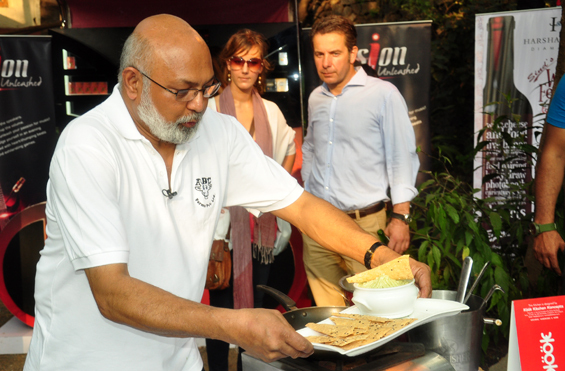 He expressed his love for Indian cuisine & his hometown Calcutta. A chef with a radiant smile and a sparkle in his eyes. He expressed his quest to create new & modern dishes with Indian spices and to bring freshness to his art as he considers himself an artist. He did not hesitate to take a picture with me & I was deeply touched by his humility. Well, I had a great time and intend to use a lot of ABC Farms cheese in my recipes. So you can look forward to fresh new recipes with some ABC Farms products on Hilda’s Touch of Spice! !